Was there talk of another Chainsaw movie in some fashion being released, or did the bombing of 3D Chainsaw preclude that? Is it just me, or do all the remakes lately seem way too formulaic. The Evil Dead reboot lacked any sense of originality. That makes me hope that no one tries to reboot Phantasm--unless it's me. Look forward to some Chainsaw postings from you soon. Unfortunately, TC3D wasn't a bomb. It tripled its production costs at the box office in the U.S. Talk of another - a part 4, even though this one was supposedly a direct continuation of the original and thus part 2 - have thankfully died down. I suppose I should still tackle parts 3 and 4 of the first cycle soon. I know this is heresy, but I enjoyed the Platinum Dunes remake of TCM well enough. It was, of course, completely unnecessary, but I actually thought the screenplay did some clever things with the expectations a fan of the original would have. 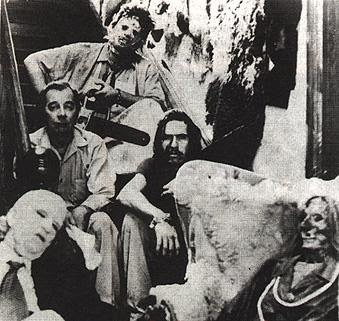 I've often thought it would be great, since just about every Chainsaw is a remake / reboot to some degree, if we someday had a TCM with the best characters from each all together in one movie. I'd pay good money to see the old gang from Hooper's films mix it up with Vilmer from part 4 and / or Alfredo Sawyer from part 3. Sigh.